In my sickness last week I got around to finishing the second season of the Clone Wars TV Show. I had mostly given up on this show but I really love Star Wars Rebels and it seems to be pulling some key characters straight from Clone Wars who were never in the books or movies. I'm trying to do my due diligence as a crazy Star Wars fan by going back and watching Clone Wars on Netflix. Season 2 is a definite improvement over season one, but it's still not that good. Everyone has told me that it gets better in the later seasons and I'm really hoping to see that when I start season 3. 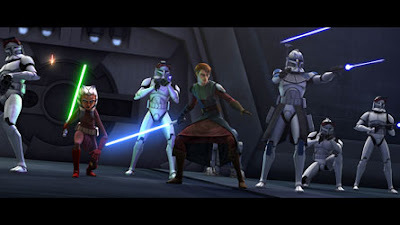 Most of the episodes in season 2 were disconnected random fights in the clone wars time period. A lot of the characters are consistent but there's no real character development at all. There's also a severe lack of overall plot. There will be two or three episodes in a row that are directly connected but none of it ever ties back in to an overarching story. Again, this is something that I've heard gets better as the seasons go on. At this point I'm just using this show as something to have on while I do other things. It's not engaging enough to simply sit down and watch it. I hope that changes soon or I might give up on the show again. At least I'm still very happy watching Star Wars Rebels weekly while it's released. It's a really good show.